This will actually be my first post… How exciting!!! 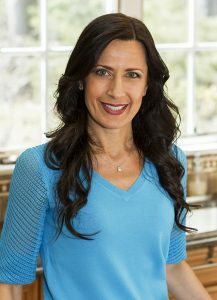 If you had a chance to look at my Cooking Story you will see I love reinventing meals into wholesome goodness! 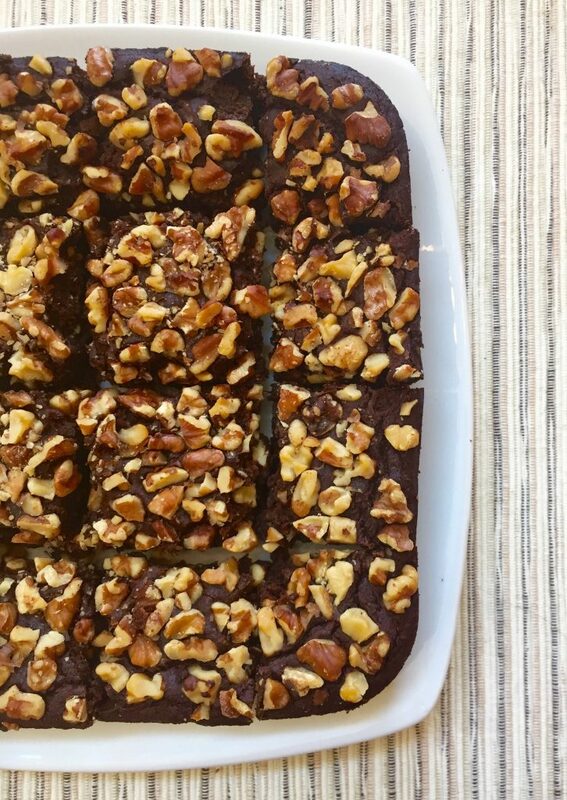 I turned a simple dessert into something vegan, gluten-free, healthy and delicious! The look on everyone’s face when I told them the ingredients was rewarding. 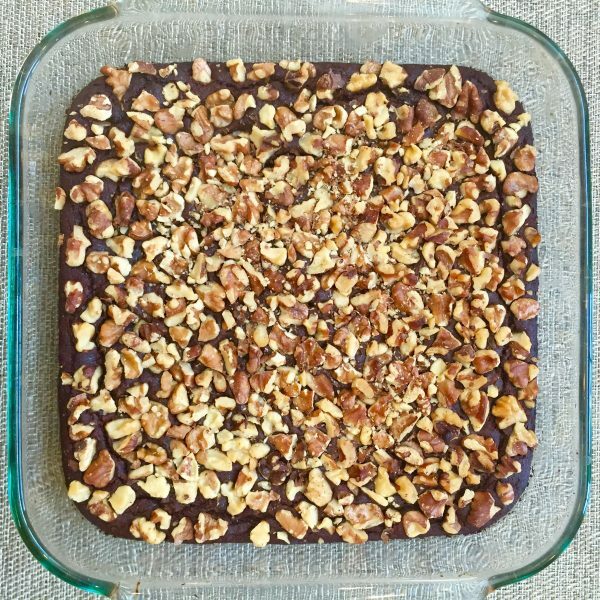 With its moist, fudge-like texture and perfect crunch this tasty treat was not only delectable but also filled with tons of nutrients! It wasn’t easy coming up with my first post but with the help of my 5 biggest food critics, my husband and kids, we decided to go with a dessert. Who doesn’t love dessert, right?! The great thing about this tasty treat is that you don’t have to feel guilty because you are actually eating spinach and chickpeas. As most of you may know spinach is high in iron… Like Popeye said, “I’m strong to the finish, cause I eats me spinach!”. But did you also know that research has identified more than a dozen different flavonoids in spinach that function as anti-inflammatory and anti-cancerous agents? I also added chickpeas which are high in protein and fiber making this a great post-run snack. Sweetened with date syrup rather than refined sugar this mouth watering delight has a lower glycemic index and is loaded with vitamins and minerals as well. 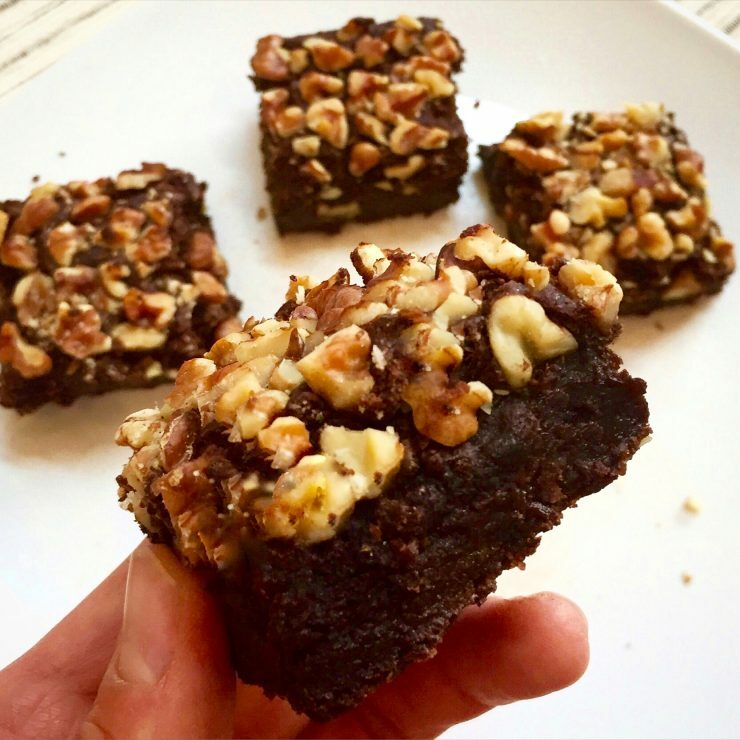 Not only does it keep the brownie moist it also has a rich delicious flavor. This vegan, gluten free, tasty treat is actually made from spinach and chickpeas! 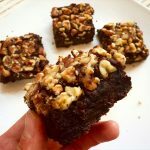 The texture is moist from the date syrup and just dense enough that it tastes exactly like what a brownie should taste like but much healthier. It makes for a great post-run snack. To make the flax meal egg mix the flax meal and water together in a large bowl until it becomes a yolk-like consistency. 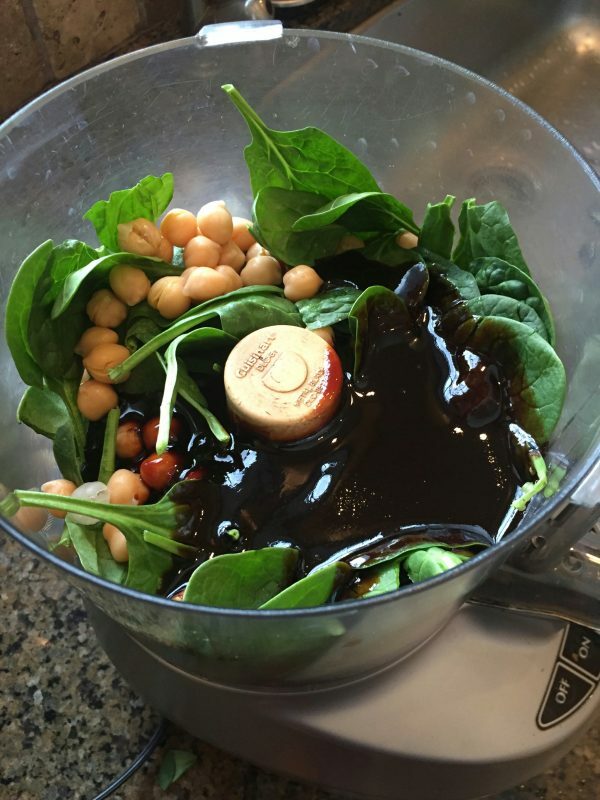 In a food processor combine beans, spinach and date syrup until smooth. 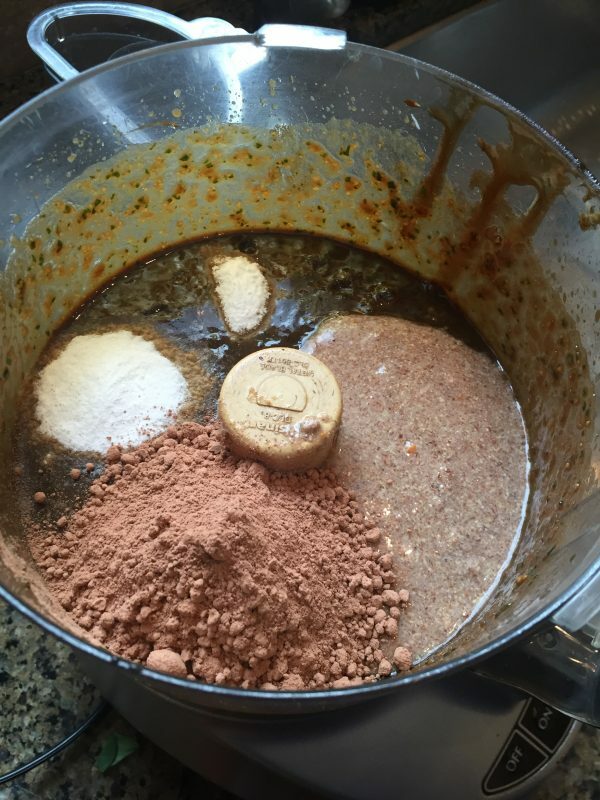 Add flax meal egg, vanilla extract, baking powder, baking soda, raw cacao and process again. 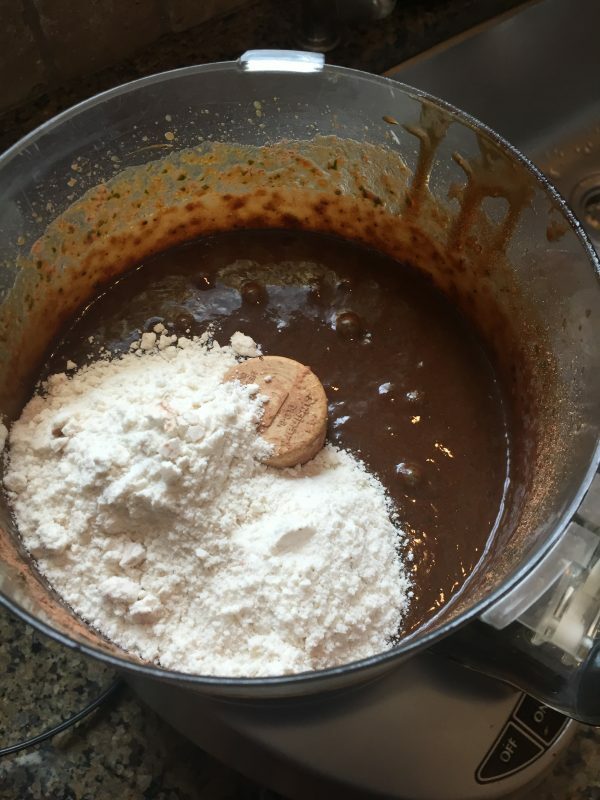 Add gluten-free flour mix and pulse until combined. 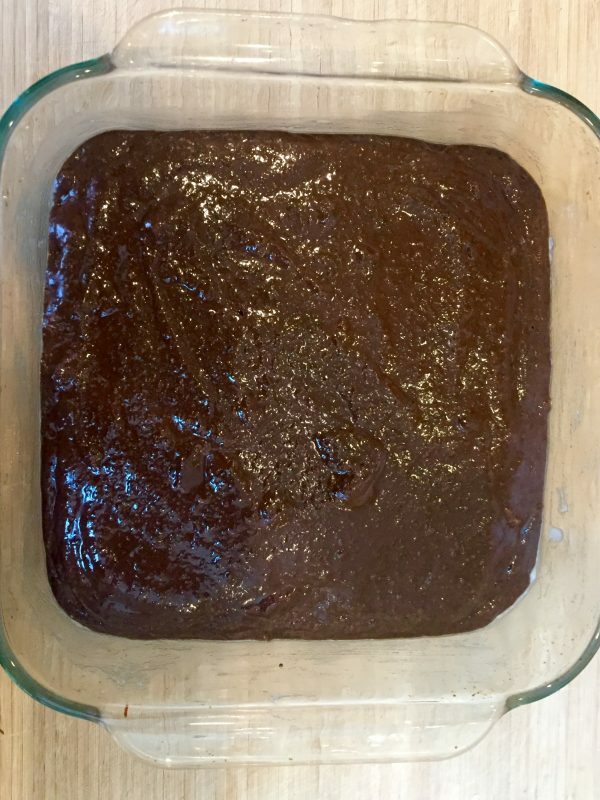 Coat the bottom of a 8x8 inch square pyrex with coconut oil and pour in the mixture. Top with walnuts and bake for 45-50 minutes until a toothpick in the middle comes clean. Try not to eat the entire tray... Enjoy! What are some of your favorite dessert? Would you try putting spinach in your dessert? Let me know what you think if you try making this! Thanks so much! Let me know what you think when you try the recipe. Love this! Already can’t wait to see your next post! Gabby this looks great. I’m going to make sure Renee sees this. Her boys are real picky eaters. Thanks for sharing. Thank you so much! I hope my recipes and tips can help her!! Can you share what type of gluten free flour mix you use? My next post will have the ingredients. I should have it complete no later than tomorrow. Thanks so much for your interest! Finally!! We are excited to see some recipes! Great job! Wow, can’t wait to try it! Definitely trying! My mouth is watering already! I love this! I can’t wait to make it for my niece and nephew! They’re gluten intolerant and they LOVE brownies! Thank you! I will be posting more GF recipes for you to try!